Texas Study of Secondary Education is a professional research journal used by members, university certification programs, consultants and professors of education for a dual purpose: to publish and to read. 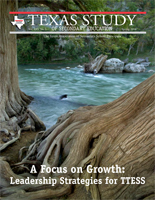 The Texas Study is published biannually and distributed to members by mail. The journal is also accessible online for members only. News Highlights is the TASSP newsletter published digitally five times a year. It includes information pertinent to upcoming workshops, legal advice from an attorney, and articles written by officers and staff. The newsletter is distributed to TASSP members and educational associations. Members are also notified about TASSP events and critical information through topic-specific e-notes and e-blasts, electronic newsletters. Online versions are available to current members only.